Troo won't let his little sister in his super secret clubhouse. But when he gets lonely and wants to play with her and her friends, will he realize his mistake? ^ ^Troo and his friends are too grown up to play with Troo's little sister. But when Keewa and Rilla go home, who will Troo play with? 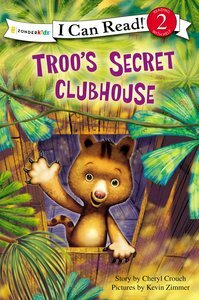 About "Troo's Secret Clubhouse (I Can Read!2/rainforest Friends Series)"
Cheryl Crouch is the author of ten children's books, including including the Chosen Girl series -Escape from the Temple of Mars; The Misadventures of Baxter Bowlingreen, III; and Lost in the Rainforest. Cheryl plays the French horn and likes to speak at summer camps. She lives in Texas, with her husband, Jeff, their four children, and a Pomeranian named Wolf. Troo stops up the river to make a fun pool, but has he thought of others' needs downstream?